The Silk Road is our passion and specialty. Zulya Rajabova and our team of experts here and on the ground internationally all hail from Central Asian countries. They are intimately familiar with the destinations, the culture, and the tourism industry there. They're exceptionally placed to ensure seamless itineraries with quality guides and service for any sized group and for specialized, custom, or luxury tours. Our well-connected, flexible team offer you and your clients with an extraordinary travel experience. We provide exemplary service to US customers, creating that all-important cultural interface in this burgeoning tourist region. Our expertise has earned us honors from the travel industry. Listed as Top Travel Expert for Central Asia by Conde Nast Traveler, and as Trusted Travel Expert for Uzbekistan and the Silk Road on Wendy Perrin's "WOW" list. We are proud of our relationships with America's best travel consultants and work hard to keep their trust, putting you and your clients' interests first. We are members of the Pacific Asia Travel Association and the American Society of Travel Agents, as well as PURE Life Experiences. "Personal and professional", "dedicated", "far exceeded our expectations", "meticulous"... Our client testimonials speak to the consistent level of experience, value and service that we provide. Our rates are competitive, yet our trips include special access, local flexibility, and unique experiences. We are with you from start to finish, ensuring satisfaction every step of the way. We specialize in presentations, webinars, agent training online and in person for certification as Silk Road Experts. Our network of travel experts extends throughout Central Asia, the Caucasus and contiguous Silk Road destinations including China, Mongolia, and Russia. 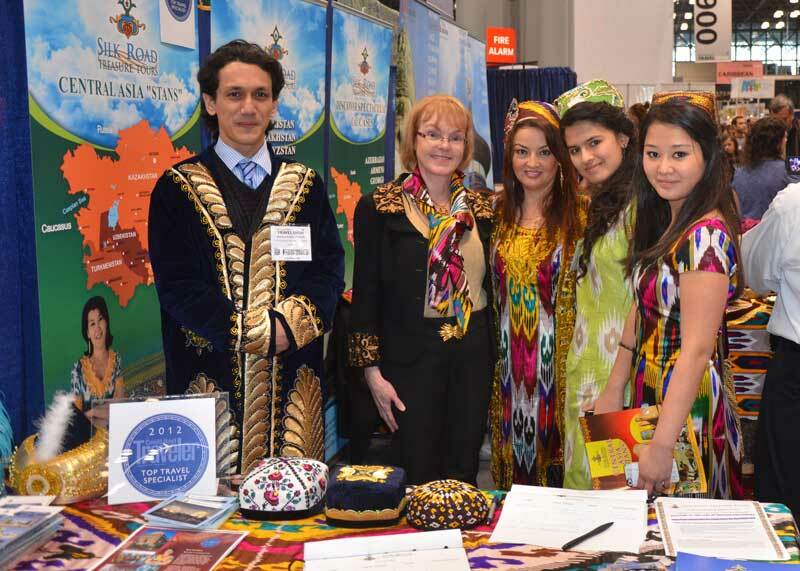 Zulya Rajabova is a regular guest speaker and presenter at SABIT conferences (Special American Business Internship Training at the US Department of Commerce, International Trade Administration) and trade shows including the New York Times Travel Show. Welcome to the exciting world of Silk Road Treasure Tours, your regional ambassador to exotic Central Asia - Uzbekistan, Kyrgyzstan, Turkmenistan, Tajikistan, Kazakhstan, the China Silk Road, the Caucasus, Turkey... place with thousands of years of civilization, yet relatively untraveled by today's tourists. As you may know, I am a native of Uzbekistan and am proud of my first-rate international team of talented, multi-lingual professionals. We use our wealth of local knowledge and experience to provide personally crafted journeys for adventurers, academics, historians, business travelers, vacationers and special interest groups. Every detail is taken care of and all arrangements are seamless. We've been part of the tourism industry there for 25 years, and in business in the US for 10 of those years. With us your travelers will discover the warmth and hospitality of people and places long hidden under Soviet Rule on a trip of a lifetime. They can follow in the footsteps of Marco Polo, Tamerlane and Chinggis Khan visiting the treasures of the Silk Road routes - the bustling oriental bazaars, UNESCO world heritage sites, stunning architecture of ancient cities and breathtaking scenery from desert to mountains. I look forward to meeting with you to share how we can offer your clients their dream trip along the fabulous Silk Road in this ancient yet fast developing and fascinating region! Once again my sincere thanks for organizing everything so well for our client. On strong recommendation we requested Silk Road Treasure Tours to organize a Central Asia tour to Kazakhstan, Kyrgyzstan and predominantly Uzbekistan for our client, a lady on her own. On meeting her in Istanbul after the Central Asia trip, she was extremely pleased at the quality of the tour, the guides and hotels that Zulya Rajabova and her Silk Road Treasure Tours team arranged. Our client was highly complimentary at the very caring service she received – as a very regular client of our company, Unique Destinations, it was vital that all should go extremely well and that she would be expertly cared for. Silk Road Treasures Tours certainly delivered what they promised and we look forward to future business with them. Silk Road Treasure Tours did a marvelous job with several of our guests who wanted to explore areas of the Silk Road (Uzbekistan and Central Asia) that we at Myths and Mountains do not do. The touring was creative and the ground service was very reliable. We feel very comfortable partnering with Silk Road Treasure Tours and letting them work with our people. I met Zulya Rajabova at a Conde Nast Summit, we are both Conde Nast Specialists, and I was immediately struck by her passion for her Silk Road Trips to Uzbekistan. Working with her is a delight. She is responsive, intuitive and attentive to details. My clients were so pleased with her Uzbekistan trip and she has already planned another trip to Caucasus (Azerbaijan, Georgia and Armenia)for them. I am happy to say what a great experience we had booking Uzbekistan and Azerbaijan tour with Silk Road Treasure Tours for our clients. This area is a new destination for Americans but Zulya Rajabova and her staff made it easy to book and helped with all details – from custom made itinerary to visas. My clients had a fabulous trip in both Uzbekistan and Azerbaijan and I look forward to working with you in future again! I can’t thank Silk Road Treasure Tours enough for the incredible Silk Road Trip to Turkey, Uzbekistan, Kyrgyzstan, Kazakhstan, Turkmenistan and China for our travelers! I want to use your travel services to the Silk Road again! Many thanks to you and your staff for your outstanding work and help in providing my client with the trip of a lifetime. My client will cherish the memories of everything he experienced in Central Asia: from the colorful markets and the warm hospitality to the magnificent old, new and restored architecture. We look forward to working with Silk Road Treasure Tours!